For those not in the know, in both art and life, violinist Rachel Barton Pine has an extraordinary ability to connect with people. Celebrated as a leading interpreter of great classical and contemporary works, her performances combine her innate gift for emotional communication and her scholarly fascination with historical research. She plays with passion and conviction across an extensive repertoire, thrilling audiences with her dazzling technique, lustrous tone, and infectious joy in music-making. Pine debuted with the Chicago Symphony at age 10, and was the first American and youngest ever gold medal winner of the International Johann Sebastian Bach Competition. Indeed, The Washington Post wrote that she "displays a power and confidence that puts her in the top echelon." Pine tours worldwide as a soloist with prestigious orchestras, has an active recording career, and has run The Rachel Barton Pine Foundation since 2001 which provides services and funding to promote classical music education and performances. 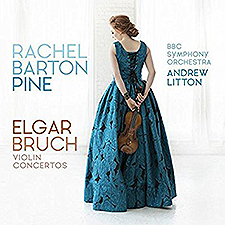 In conjunction with the release of her brand new classical work of art, Elgar Bruch Violin Concertos (her 36th album and fourth for AVIE Records), it should be known that Pine was just 11 when she first performed Max Bruch's Violin Concerto No. 1 with the Chicago Symphony Orchestra! She has performed it many times since then, and now, 32 years later, she's recording this work for the first time. It's paired with an unlikely partner, Edward Elgar's Violin Concerto, but don't allow that to sway you connoisseurs away from the fact that what Pine has brought forth here today on this new album is nothing short of stunning. It's also interesting to note that this recording is actually dedicated to the late Sir Neville Marriner, who died suddenly in 2016 at 92. "Yes, this was going to be Sir Neville Marriner's first recording of the Elgar", Pine herself explains. "He was going to do this album with me. We had previously recorded the complete Mozart concertos together a few years ago and were planning to reunite for these two concertos." "When he was a young violinist, Sir Neville had studied the Elgar with his teacher, Billy Reed, the great London concertmaster who had been the very violinist that Elgar consulted while writing the piece." "Sadly, he passed away right before the session, and so I was like, 'Oh, no, what are we going to do?' But thankfully Andrew Litton was able to step in, and I am so grateful that he did such a wonderful job, and it really worked out well." Observationally, sure the pairing here of the Max Bruch Violin Concerto No. 1 with the Elgar Violin Concerto is not the most obvious coupling that could have first sprung to mind, but as Chicago-based Pine obviously approached both works with the same physical manner of playing, her unique styling has allowed them to blend rather seamlessly.